Advocating play in this time of structured socialization in the young, handy electronics and city living, Play Pilipinas has combined forces with the international community to bring to Filipinos the first ever Play Festival to be held in the country. ~ For P10,500, educators, school owners, play advocates and homeschoolers can attend the 3-day conference and learn from esteemed local (e.g. Dr. Honey Carandang, Dr. Maria Teresa Gustilo-Villasor, etc) and international (Marcus Veerman, Anita Bundy, etc) speakers who are experts in the different aspects involving and affecting play. The conference fee includes a DVD on children's play, an exclusive magazine, the conference kit and snacks. ~ For P1,000, mini-workshops are available to educators and intentional parents who want to acquire certain skills or knowledge on various aspects of play. Examples of topics to be covered are Keeping Playtime Safe (by Toni Tiu of wifelysteps.com), Ideas for Outdoor Play and Integrating Play in the Curriculum. 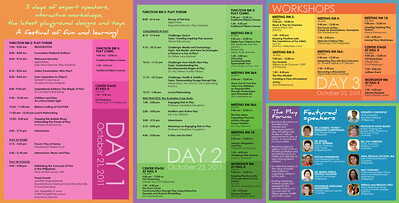 Play Pilipinas Registration for the conference/mini workshops will CLOSE on 30 September 2011. Please send your forms to reserve a slot - be it for the forum or workshops to playnow@playpilipinas.org or fax via 02-634 0416. • TOY FAIR: A toy fair with over 50 booths, each featuring the latest tools and toys for active play. Organized by age bracket. • BOOK AND MAGAZINE FAIR: A veritable showcase of the latest and best titles covering play and child development. • CHILDREN'S NUTRITION FAIR: A taste of the kind of food that makes for fun, delicious and healthy eating for kids. • CHILDREN'S FASHION FAIR: An exhibition of outfits fit for active play and other children's activities. • SCHOOL FAIR: A venue for schools or institutions to showcase their programs and the ways they integrate play into their curriculum/activities. • WORLD TOYS EXHIBIT: An exhibition showcasing toys and games from around the world. ~ Play Pilipinas held a playground design challenge that invited everyone from the country to "design creative and inspiring playground structures and spaces that will give a sense of place, wonder and fun to entice children, teens and adults to play outdoors." The top five finalists will have their designs installed in the SMX premises for fair guests to enjoy. ~ Another installation that should get fair guests interested is the playground design chosen by President Obama for his daughters (so yes, fair guests will have 6 playgrounds to frolic in). Entrance to the Play Festival is P100 each, regardless of age. This entitles you to 2 and 3 and some of 1 (Kitchen Playtime talks at Workshop Room Hall #4, for example). See you all there. Let's help a cause, advocate play and tire our kiddos out in one go.